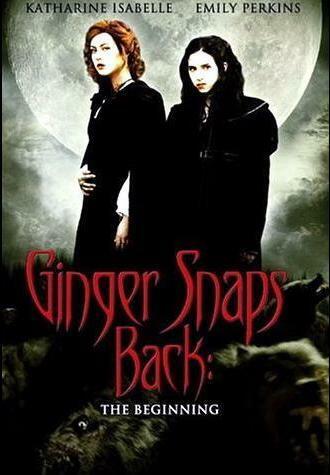 This may be the weakest of the three Ginger Snaps films. Not that it is not a good movie, but it really does not live up to the other two. Had I not compared it to the other two, I probably would have thought more highly of it. As a stand alone film it is strong, just not as strong as the other two. Having said that, the other two were easily 8-9 out of 10 stars. It may be unfair that this one will always be compared to the others, but it is hard not to evaluate all three together, especially as this one is a prequel. One area in which this film is better than the other two is the cinematography. This one should have won an award in this respect. It is set in 1800s Canada and much of the film takes place in a forest. The color, contrast and scenes are excellent. The film was nominated for an award by the Director's Guild of Canada, but the nomination was for sound editing. Of course, if you have read my other Ginger Snaps reviews, I think that Emily Perkins is one hell of an actress and I am surprised that she hasn't had her big break. I see that she stays very busy, but I expected her to have a huge break through performance by now. I thought that Katherine Isabella was strong in all three films also. I read that they are both doing a film together now called "Another Cinderella Story". Overall, the acting as a whole is well above average. The story attempts to explain how Katherine Isabella was bitten by a werewolf in the 1800s. The werewolf is a young boy living in an old fort with his military father. The father tries to keep him hidden away as he would likely be killed if discovered. This film again places Emily Perkins in the role of heroine. I will not ruin the story for those that have not seen it, But, I will say that her character must kill the werewolf that bit her sister to save her. The story is entertaining and there are a few plot twists. There is not alot of gore, but what gore there is looks great. As in the other two, the effects are very good. Overall, there are many pluses for this film. However, there is less drama and you simply don't connect with the characters as well. I do not want my prior criticism to steer you away from watching this one. It is a solid movie on its' own. It does not however, stand up to the other two.